Oh this wedding. First off- this day was such an insane day! Not only did I have this wedding- but a shower in The Glass Box, and it was Ada's recital. It was a day of orchestration that started at 5am and ended at 1am. Needless to say - I was a little tired! 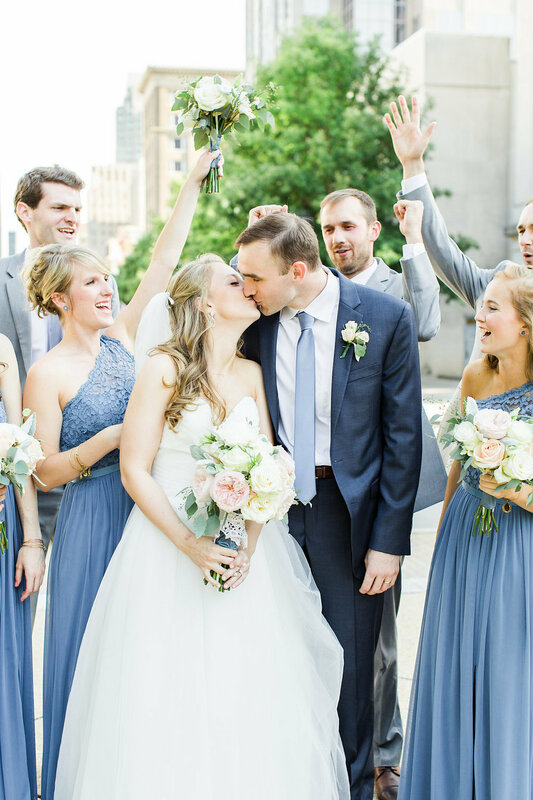 Alison really wanted to focus on the dusty blue of the bridesmaids dresses and add in some touches of ivories and blush to soften it up a little bit. We wanted the stockroom to have a more garden feel than a rustic look so we mixed in lots of greenery and lanterns. Alison and her mom collected lots of lanterns and little items to help make the space more personalized to Alison and Brad. it turned out beautifully! The ceremony was in the stockroom and while guests were at Mahler enjoying cocktails and apps- we flipped the space upstairs. One of the neat and smart ideas we decided on was using all the centerpieces as pew markers. It was not only cost effective- but GORGEOUS! I loved the set up for the ceremony - it was so pretty! There were so many fn details from this day! They had a breakfast menu - which Rocky Top knocked it out of the park!! It was so yummy! And Sugar Euphoria put together an amazing dessert buffet that guests could not stop talking about. Alison's mom made her famous shortbread to add to the array of desserts and it was also a huge hit. Alison could not stop smiling all day. She was seriously one of the happiest brides. Brad was pretty smitten with his gorgeous bride and they did not leave the dance floor. I think the highlight was the "90's power hour" where everyone was dancing, singing, and just having the best time. I loved this family, I loved this bride, and I am so very grateful they chose C & D to be a part of their day! Thanks Alison and Brad (and Jane!!) - it was wonderful! And now for pictures from the awesome Annie Watts.